Health Exams– Kittens will need 3-4 exams to properly vaccinate them and make sure they are free of infectious and contagious diseases. Adult cats aged 1-7 years need annual health exams. Cats over age 7 are considered senior pets and should be seen every 6 months. Vaccinations– Core vaccines are recommended for indoor and outdoor cats. Core vaccines include the rabies vaccine and the FVRCP vaccine (also called Feline Distemper vaccine). Outdoor cats are at higher risk for other infectious diseases, including the FeLV virus. 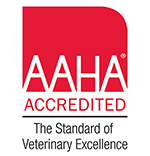 We will discuss the appropriate vaccinations for your cat with you during your appointment. All vaccinations are based on your cat’s risk assessment. Wellness Screening Profiles– We have specially designed wellness profiles for adult and senior cats. These profiles are used to detect disease early, before they can cause your cat to become ill. Both profiles include blood and urine tests.